The public were doing all the hard work in assessing their eligibility for financial help with court and tribunal fees. A new service places the administrative task with court staff. When we started our service transformation, we looked at the whole service and identified pain points and inefficiencies for both applicants and court staff. One of the things we found was that the task of assessing eligibility was placed on the applicants. Eligibility is complex and, more often than not, applicants were unable to complete the paper form correctly. Up to 70% of applications were being rejected as they were incorrectly completed. This meant that court staff spent a great deal of time writing to applicants, highlighting mistakes and explaining how they should be corrected. For example, a question about savings amounts was consistently misunderstood by applicants. On the previous paper form, this question was called the ‘Disposable capital threshold test’. In doing our research, we found that both the language used and the tasks to be completed were confusing. The question also relied on applicants referring to the extensive guidance that accompanied the form (which most people did not read). We found the majority of applicants had no savings, and that most of the fees they needed help with were relatively small amounts of money. Therefore, we were able to simplify the journey for the majority of people by filtering out questions they didn’t need to answer. We also added guidance into the form itself, removing the need for applicants to refer to a separate document in order to understand the question. We provide an extra question for those applicants who do have savings, but may still qualify for financial help. This allows staff to correctly assess their situation eligibility. This solution was tested and iterated during our redesign of the paper form. We have received very positive feedback from the public, as well as charities and court staff. In fact the percentage of incorrectly completed forms has fallen significantly. We’re using what we learned from redesigning the paper form to design an online service for people to apply for help with fees. Have you developed similar solutions to transform government services? If you have, we'd like to know about your experience or your thoughts on what we've done. 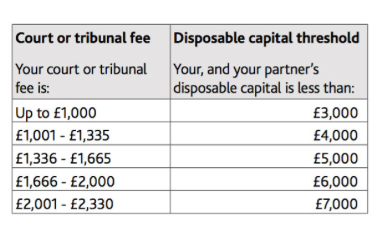 A very small point, but worth considering for all forms: in the example image above with answers 'Less than £16,000' or 'More than £16,000', what would I do if I had exactly £16,000? Thanks Andrew – good point. A clearer option might be '£16,000 or more', or something along those lines. I'll feed that back to the team. Thanks for spotting and pointing that out. When is the new online fee remission service expected to go live? The Court forms were amended on Monday 27 June 2016 to add a reference number for online fee remission but I cannot find any information on when the online service will be available. Thanks. Hi Charlotte, apologies, we're currently doing a final round of quality checks on the new service. We are hoping to go live soon and will update the URL gov.uk/help-with-court-fees to direct people to the new service as soon as it’s live. Completed online applications will generate a help with fees (HWF) reference number which can then be added to court and tribunal forms.